In an impressive display of ingenuity, technical prowess, and stamina, Brightcove’s 24-hour Hackathon wrapped up this afternoon with each of the nine teams presenting their final demonstrations to audiences in our Boston and Seattle offices. While the projects on display covered a dynamic range of applications, from practical to esoteric, they all reflected the great minds that are hard at work here at Brightcove every day as well as the intense passion for innovation that is so prevalent across the company. Two-thirds of team Appmatic, Jesse Streb and Adam Mark, present their project. 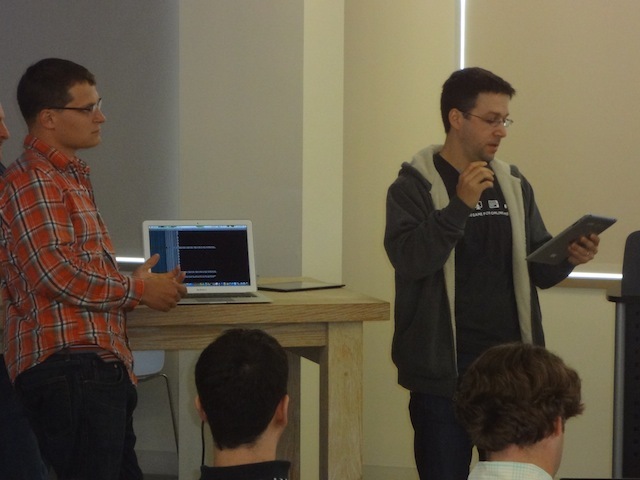 The first-place winner of the Hackathon was team Appmatic, comprised of Adam Mark, Jesse Streb, and Brice Stacey. Second place ended in a tie between team Rocket Appliances - Alana Lynch, Mike Reed, and Will Cheung - and Salmon, the formidable one-man-team featuring Sam Neubardt. We can’t wait to showcase a number of these projects at our PLAY global customer conference later this month in Boston, where we’ll be able to speak in greater detail on the nature of the Hackathon and recognize our winners. For more information and to sign up, visit play.brightcove.com. In the meantime, we invite you to visit Brightcove’s Facebook page to check out pictures from today’s presentations.